Protesters march in solidarity with undocumented migrants detained in a maximum-security prison without charges or trials. 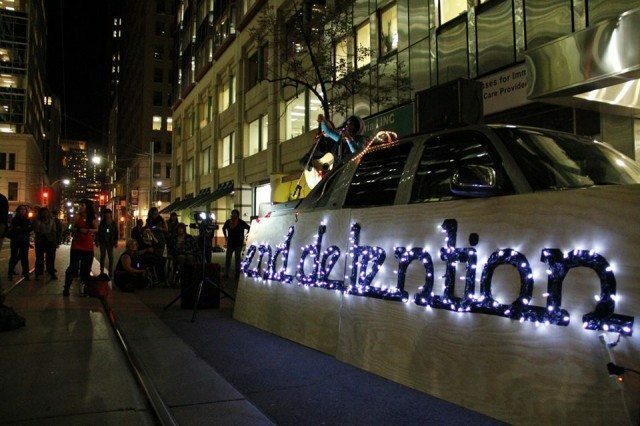 A truck bearing the words “end detention” served as the stage for last night’s concert. Photo from the No One Is Illegal Facebook page. Last night, about 100 protesters gathered downtown to mark the anniversary of one of the largest acts of migrant dissent in Canadian history. On September 17, 2013, 191 migrants being held at a maximum security prison in Lindsay, Ontario, went on hunger strikes to protest their detention by the Canadian government. Many of the detainees have been in jail for several years without charges or a trial, and they claim their detention violates international law. In July, a human rights working group at the United Nations ruled that the indefinite detention of migrants is never justified. However, many of those detained in Lindsay remain there without any idea of what their future will hold. Protesters marched from Cloud Gardens near Richmond and Yonge, led by a truck strapped with speakers and a generator, to 74 Victoria Avenue, the offices of both the Immigration and Refugee Board, which decides the fate of undocumented migrants, and the Canadian Border Services Agency, which enforces immigration rules. They then listened to speeches, spoken-word poetry, and live musical performances from local artists, all of whom had messages of support for the jailed migrants. Rosina Kazi, vocalist for the local music group LAL, told Torotnoist after her performance that Canadians take undocumented migrant workers for granted while benefiting from their labour. “A lot of people refuse to realize who’s doing some of those difficult jobs in farms and factories. People are being used internationally as slaves.” Kazi also compared the migrants’ situation to the one facing indigenous people. “The same colonial system has oppressed both peoples, so I think there’s a lot of opportunity for solidarity among these people,” she said. Criticism of the CBSA, IRB, and the federal government over the detention of migrants has grown over the past year. In February, the BC Coroners Service called an inquest into the death of Lucia Vega Jimenez, a migrant hotel worker who hanged herself while being detained by CBSA. Jimenez was reportedly afraid of returning to Mexico because of a domestic situation. In August, residents in the Jane-Finch area condemned CBSA and the province after 21 migrant workers were stopped under the guise of a “vehicle safety blitz” and then detained by immigration authorities. All of the workers were from the Spanish-speaking community, and outraged residents and advocates accused the province and CBSA of racial profiling.